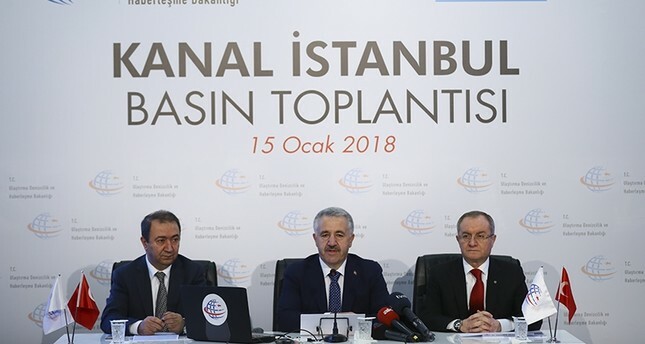 Arslan said at a press conference at the ministry in Ankara that the Küçükçekmece-Sazlıdere-Durusu corridor, the fourth alternative for the project, was chosen as the most convenient route. He added that the 45-kilometer route will enter Küçükçekmece Lake and reach the Black Sea through the Sazlıdere Dam from east of the Terkos Lake. President Recep Tayyip Erdoğan announced the project to the public in 2011, while he was prime minister. "We intend to complete the bidding process with a mixed model, including a build-operate-transfer model, and other public-private partnership alternatives, and to launch the project this year," Arslan said. Arslan said the first target in the project of making a new waterway connecting the Black Sea with the Marmara Sea on Istanbul's European side is to reduce the ship traffic on the Bosporus in Istanbul. Explaining that the target is to reduce the risks that could arise from vessels carrying dangerous substances through the Bosporus and to provide a more modern life to the people who live in that area by carrying out urban transformation projects on the waterway route and removing irregular urbanization, Arslan said the third goal is to increase both the position and attractiveness of Turkey with waterway transportation in Istanbul. The canal is expected to have capacity for 160 vessels a day and is scheduled to be completed by 2023. Arslan said that all the work carried out by the ministry's General Directorate of Infrastructure Investments and related institutions and organizations were evaluated and that bidding for the preparation, project and consultancy services were held last year, adding that the work was initiated in August 2017. Arslan said that all work, including the determination of alternative routes, evaluation of the current situation, numerical model studies, earthquake, tsunami, wind and wave climate and geological surveys were completed by the beginning of the year, explaining that each topic was handled in detail. Arslan said that they received support from experts who specialized and active in their fields from Turkey's leading universities such as Istanbul Technical University (ITÜ), Boğaziçi University, Middle East Technical University (ODTÜ) and Gazi University, as well as international experts, and that they continue to work with them. He said that they received data from the work conducted by 35 institutions and organizations in the planned areas, adding that they identified the environmental conditions, flora and fauna. "Taking into account the feasibility within the framework of various elements such as mine, site and sensitive areas, geological studies, underground and surface water resources, soil resources, effects on maritime and transport networks, splitting volume, channel length, expropriation and effects on residential areas, studies continued on five routes," Arslan said. According to numerical modeling studies, he said the preliminary models that will be the basis of the basic survey study was completed. He said groundwater currents along the project route were detected, adding that different types of earth were identified, and the permeability of each was determined to be different. Noting that their work is carried out more precisely in the determined corridor in order not to adversely affect the ground water, Arslan said they will continue working more sensitively on the identified alternative. He said that all studies were done taking into account earthquake risks and the average recurrence of 72 years, 475 years and 2,475 years. Suggesting that the parameters related to tsunamis were also identified, Arslan said that detailed studies are being carried out and that there will be no negative effect, according to the preliminary report. He said that modeling studies were carried out in the project area using wind data from about 25 years. "The wind and deep-sea currents at the entrance of the Black Sea and Marmara Sea related to the project area were examined," he explained. "The effect of the currents from ship passage in the canal on the side surfaces has been evaluated according to the most negative scenarios and detailed studies are under way." Arslan said that 17,000 meters of drilling was completed, including 7,000 meters in addition to the initial 10,000 meters, by the end of 2017, and that they will be used as filling material for excavations from the canal. Arslan said that when the route studies were carried out, they paid attention to avoid interaction with the Terkos Lake water basin and not to negatively affect Baklalı and Dursunköy residents. "All of these projects will continue to be evaluated together, including the project areas, which can be used as a logistics center, and the artificial islands that can be made by filling the Marmara Sea with the filling material to be produced in the Black Sea," Arslan said. Arslan said that the three passages on the Marmara side are aimed at passing under Küçükçekmece Lake with an immersed tube as with the Marmaray project and they will make all the other alternatives in the north as bridge crossings. Arslan said that there would not be long-distance viaduct crossings. He explained that in such a large project, quoting the budget without finishing the canal work, including financing modeling, may be misleading. "But there is a fact that at the moment the biggest project of our country is the third airport with about 10.5 billion euros. This is the biggest project with a rental fee of 22 billion euros for 25 years of operation. However, Kanal Istanbul will be bigger than that," he said. Arslan thanked Erdoğan, Prime Minister Binali Yıldırım and ministries for their contributions to the project.